Muriel, Ollie and Emma relay the events leading up to WWI when two of their number decide to join the army. We also get a glimpse into the women's civil rights movement as it relates to Muriel's family. This verse novel alternates between the voices of Muriel, whose words are shaped like a river, and Emma/Ollie, whose words are shaped like crossing stones. The "stones" also have a special rhyme scheme that the author explains in her notes. Each chapter is made up of several poems and covers a month from April 1917 to January 1918. My first thoughts on picking up this book were "not another war novel". This year's Newbery hopefuls are replete with them. Helen Frost writes about WWI but I've read about WWII, 9/11, and the War in Kosovo. 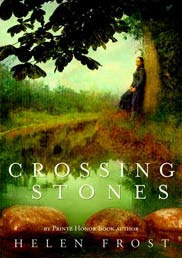 Crossing Stones alternates voices but in a way that's not disruptive to the book's overall tone. I found myself understanding both Muriel and Ollie's viewpoint because their characters are well drawn. You understand why they make the choices they do. Muriel is "plucky" but not overbearing and she's also thoughtful. Through their eyes we also get a sense of the other characters. The plot had just enough history to make it interesting but not boring. Each poem was like it's own little story within a story. The writing was so vivid and the story moved quickly. Frost didn't just focus on the homefront, what happened to the people left behind, but also gave us a little taste of the warfront as well as the suffragist's movement.